For a bibliography of articles on this event, click here. On May 2, 2017, a polite letter arrived from the Director of the Political Committee of the NATO Parliamentary Assembly (known as NATO PA) asking whether my organization, the Middle East Forum, "might be able to host a set of meetings and discussions" for assembly members. 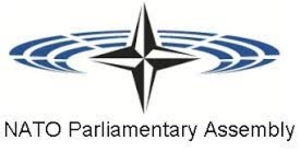 For those, like me, unfamiliar with NATO PA, it is "a unique specialized forum for members of parliament from across the Atlantic Alliance to discuss and influence decisions on Alliance security." Its Political Committee "focuses on all political questions concerning the security of NATO and its member and partner countries." The Forum quickly agreed to host the meeting on Sep. 19 on Independence Mall in Philadelphia and began inviting experts to brief the 26 members of parliament from 12 countries, ranging from Norway to Turkey, Poland to Portugal. Given the centrality of Turkey to both the Syrian conflict and to the deeper issue of NATO's mission (does it fight Islamism as it once did communism? ), we invited representatives of two key Turkish factions, both of them Islamist: the government of Recep Tayyip Erdoğan and the movement of Fethullah Gülen. 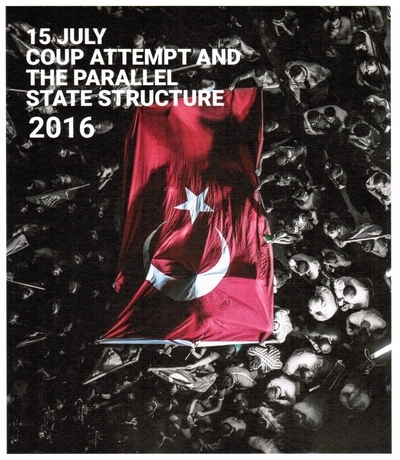 Propaganda distributed by the Turkish delegates at the MEF-NATO Parliamentary Assembly meeting. Emre Çelik, president of the Rumi Forum, a Gülenist intellectual group, immediately agreed to speak. However, for the longest time we could not pry a reply to our invitation out of the Turkish embassy in Washington. Finally, less than a week before the event was to take place, the Political Committee staff informed us that no less than the presidential office in Ankara demanded we remove Mr. Çelik from the program. If we refused, it would cancel out on us. My initial reaction was, "Fine, cancel it." Having sunk much time, money, and reputation into the conference, however, the Forum hardly relished pulling the plug. We also did not want to join the ranks of Western appeasers, such as NATO PA, who submit to the will of Turkey's dictator, Erdoğan. What to do? We adopted an unusual course of action: Yes, Çelik's name came off the program and the embassy diplomat showed up. But with Çelik's concurrence, we arranged for him to enter the meeting through a back door and wait quietly in the wings until I, after speaking in the final session about the disgrace and damage of NATO's submitting to Erdoğan's will, invited him to the podium to address the conference. The Turkish delegation loudly interrupted the proceedings before storming out. On concluding his remarks, the co-chairman attempted to close the meeting but I interfered, asserting it was our event, and again invited Çelik to speak. As he began, first the Turks and then the entire NATO PA delegation exited the hall, leaving behind only our other guests, who proceeded to give him a standing ovation. 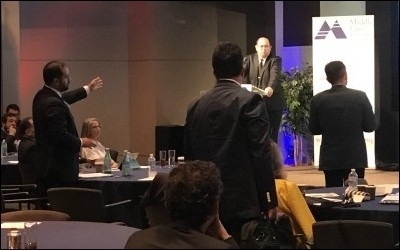 Emre Çelik spoke and Daniel Pipes looked on. I proffer my apology to NATO PA for pulling this trick. But I stand by the deception. It was impossible for us to ignore NATO's founding principle "to safeguard the freedom" of its peoples. It was equally impossible to ask the Forum, especially as it met within sight of Independence Hall and the Liberty Bell, to acquiesce to the diktat of a foreign tyrant. Indeed, despite the walk-out, I hope the NATO Parliamentary Assembly delegates secretly admire our taking a stand against tyranny and draw inspiration from this small act of defiance. Perhaps they will learn to stand up to Erdoğan's bullying – precisely what they did not do in this instance. Mr. Pipes (DanielPipes.org, @DanielPipes) is president of the Middle East Forum. © 2017 by Daniel Pipes. All rights reserved. Sep. 19, 2017 addenda: (1) On Sep. 11, at the Warsaw meeting of the Organization for Security and Cooperation in Europe's Human Dimension Implementation Meeting, the Turkish delegation declared it "simply revolting" that a Gülen organization had been allowed in. To which the chairwoman said, more or less, don't let the door hit you on the way out. Comments: (a) Not every international organization is as weak-kneed as NATO PA. (b) Given the nature of these two institutions, I would expect OSCE to fold and NATO to stand strong. But no. (c) Ankara has its own version of the Hallstein Doctrine (whereby West Germany in 1955-70 refused to be part of anything if East Germany was present); properly responded to, it should isolate Turkey. (2) I wonder why it chose to publicize its repressive actions, but the Turkish Delegation to the NATO Parliamentary Assembly has issued a press release (in Turkish and in English) about today's little fracas. Of course, it calls Çelik member of a "terrorist organization" when he is a mild-mannered academic. 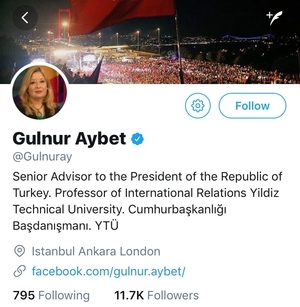 Of course, it calls me "this notorious anti-Turkish person," when I am an anti-Erdoğan person. More surprising is the bare-faced lie that Çelik spoke "to empty chairs and walls." Hardly. As the photograph below shows, the room was quite full even after Çelik had finished his talk. But then, fabrication large and small is what tyrannies do, no? Doesn't look like "empty chairs and walls" to me. Sep. 20, 2017 updates: (1) Sabah, possibly the most maniacally pro-Erdoğan newspaper in existence, repeats the press release fabrication about Çelik talking to an empty room in the very title of its coverage about the MEF-NATO PA event. "NATO toplantısına sokulan FETÖ üyesi boş salona konuştu" (The FETÖ [i.e., Gülen] member talked to an empty room at the NATO meeting). Headline: "The FETÖ member talked to an empty room at the NATO meeting." 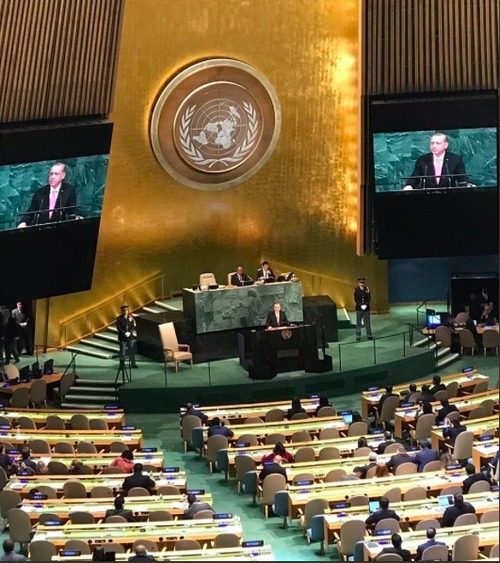 (2) Çelik wittily tweeted a picture of Erdoğan at the United Nations talking to a mostly empty hall and wrote, "Look and see who's the one that spoke to empty chairs :)"
Sep. 21, 2017 updates: (1) Gülnur Aybet, a senior advisor to Erdoğan, has jumped into the fray with a 3-part tweetstorm (it starts here). (3) Writing in regime-friendly Nabız Haber, Haşmet Babaoğlu-Sabah suggests that if NATO meetings are becoming hostile, it may be time for Turkey to leave the alliance. I concur. (4) The Fars News Agency, nominally independent but in fact an agency of the Iranian government, has heartwarmingly supported Erdoğan in this little tiff, even going so far as to use the FETÖ nomenclature (that states Gülen's movement is terrorist) with regard to Çelik. Comment: I'd be surprised if any other government, with the exception of Qatar, comes to Erdoğan's defense. Basically, Erdoğan has no friends. Sep. 24, 2017 update: The Sunday Express reports NATO PA Secretary General David Hobbs saying that "We are partly to blame for what happened on Tuesday[, Sep. 19] because we did not initially spot the link between Mr Çelik and Gülen." In the NATO PA myopic sense of democracy, he opined that so long as Turkey has a functioning parliament and opposition member of parliament, it will continue to be classified as "democratic." 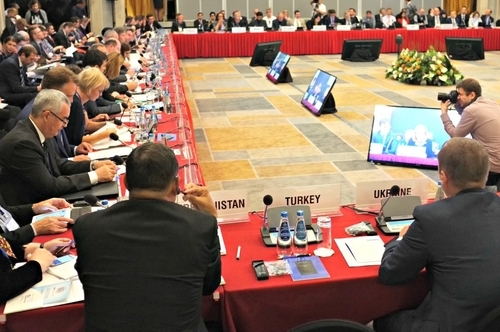 How much will the Republic of Turkey be missed at the HDIM meeting? 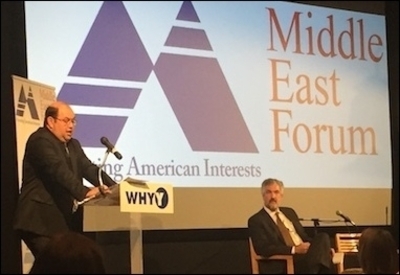 Middle East Forum, "Turkey Attempts to Stifle Free Speech at MEF-NATO PA Event," MEForum.org, Sep. 19, 2017. Christopher C. Hull, "Turkish NATO Delegation Walks Out of Event Over Dissident Speech," Daily Caller, Sep. 19, 2017. "Turkish Delegation Attempts to Censor Speech At MEF-NATO PA Event," Stockholm Freedom Center, Sep. 20, 2017. "Philadelphia'da Kimin Konuşacağina Türkiye'deki Bir Diktatörün Söylemesine Müsaade Edilemez," TR724, Sep. 20, 2017. "NATO toplantısında FETÖ skandalı," Milat, Sep. 20, 2017. "Türk heyeti NATO ve Orta Doğu panelini terk etti," Aktif Haber, Sep. 20, 2017. Paul Miller, "Turkey Walks Out of NATO Conference Over U.S. Freedom of Speech," American Spectator, Sep. 21, 2017. Winfield Myers, "Turkey's Erdogan Tries (and Fails) to Censor an American Think Tank," Sep. 21, 2017. 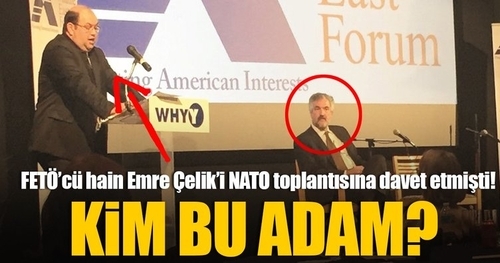 "FETÖ ve Daniel Pipes... NATO'yu da kuşatma altına aldılar!" Sabah, Sep. 21, 2017. The pro-Erdoğan Turkish newspaper Sabah published a graphic asking, in the large font, "Who is this man?" "NATO-PA mit türkischer Delegation endet mit Eklat," Turkish Press News, Sep. 21, 2017. "Turkish NATO delegation walks out after FETÖ member allowed to participate," Daily Sabah, Sep. 22, 2017. Gregg Roman, "NATO needs to admit Turkey is shredding democratic values," The Hill, Sep. 22, 2017. Michael Totten, "The Black Sheep of NATO," World Affairs Journal, Sep. 25, 2017. Brian Grodman, "NATO forum hears Mideast issues," Jewish Advocate, Oct. 6, 2017.